The official tourism website focusing on the Exmoor area from North Devon to West Somerset and Quantock Hills. All official marketing points to this website. Reach a worldwide audience interested in coming to Exmoor. A site full of inspirational ideas and experiences. Advertise your business on the main Exmoor website and get new customers while supporting the promotion of the area worldwide. The web is the first place to look to find things to do and places to stay. The Visit Exmoor website brings visitors to Exmoor, including part of North Devon, West Somerset and the Quantock Hlls. Those finding our site are more likely to want to visit Exmoor and are therefore, more likely to buy through the website. Through careful optimisation of the site and with our marketing and promotional efforts pointing back to the Visit Exmoor website, we are attracting those already interested in Exmoor and its surrounding countryside. When looking for anything to do with Exmoor, you are more likely to land on the Visit Exmoor website than any of the neighbouring websites for North Devon or Somerset. Visitors will be more inspired by our site, because it specialises in everything to do with Exmoor, the Quantocks, West Somerset and part of North Devon. 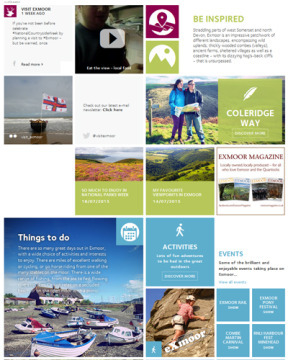 Type into a search engine ‘what to do on Exmoor,’ Visit Exmoor’s Things to do page comes top of the list. Type in ‘Exmoor holiday accommodation’ or ‘holidays on Exmoor’ and the Where to stay page is at the top. Exmoor is promoted in magazines, newspapers, occasional TV adverts, social media, newsletters and exhibitions. All this promotion is targeted back to the Visit Exmoor website. The Exmoor National Park also promotes the area and refers back to the Visit Exmoor website for accommodation. It works on all screen sizes, from a desktop to a tablet down to a mobile. It automatically knows what size screen it is being viewed on and adjusts the design so the user-experience is still enjoyable - ideal for those downloading last minute ideas on smart phones. Responsive design – adjusts automatically to different screen sizes, such as smartphones and ipads. Fast and user-friendly – easy navigation finds what you are looking for quickly. Map-driven searches – uses an interactive map to find accommodation and things to do. Visitors do not need to know Exmoor to find your business. Different map icons are used and list-search is also available. Randomised adverts once a day at midnight, to maintain site speed. Comprehensive stats for advertisers, clcik throughs counted to your website, to the Book Now button, Special Offers and Directions. Embed your online booking calendar into your advert so visitors can immediately see your availability. Embed your TripAdvisor rating into your advert. Visitor experiences – many unique experiences promoted. Ability to add choices to ‘Favourites’ within the website. View your own advert stats. Events attract visitors to the area. Better use of these throughout the site. A central point for all our social media. Up-to-date information promoting services and products.